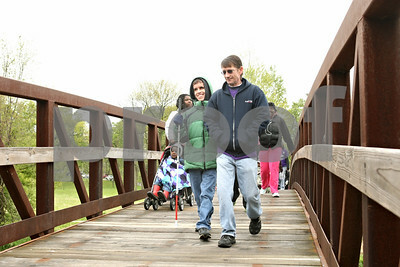 Rob Winner – rwinner@shawmedia.com Cody Marbutt (left), 16, walks with his father, Mickey, while participating in the March for Babies event which kicked off at Hopkins Park in DeKalb Saturday morning. 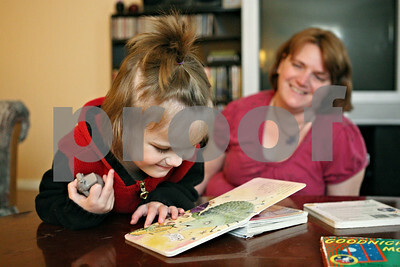 The Marbutt family was the Ambassador Family for the DeKalb County 2008 March for Babies. 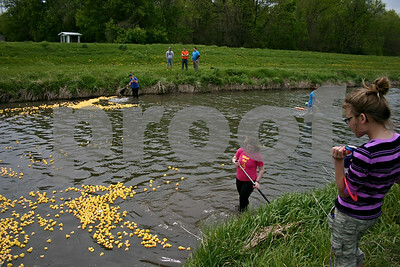 Jeff Engelhardt – jengelhardt@shawmedia.com Kevyn Marshall watches Alpha Phi Omega members push hundreds of rubber ducks down the Kishwaukee River during the 12th annual Duck Race. 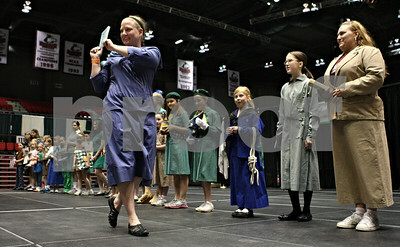 Rob Winner – rwinner@shawmedia.com Meg Spires, of West Chicago, holds up "How Girls Can Help Their Country: Handbook for Girl Scouts," while wearing a replica 1913 Girl Scout uniform during a historical fashion show at the Girls Scouts of Northern Illinois Centennial Celebration at the Convocation Center in DeKalb Saturday afternoon. Rob Winner – rwinner@shawmedia.com Lila Tellone, 4 of Aurora, is helped by her mother, Darcy Tellone, while making a reusable bag from an old shirt as part of the Girl Scouts Forever Green service project during the Girls Scouts of Northern Illinois Centennial Celebration at the Convocation Center in DeKalb Saturday afternoon. 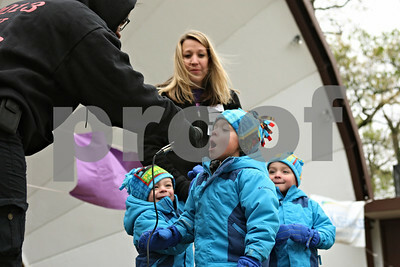 Rob Winner – rwinner@shawmedia.com Elizabeth Elie (far left) holds the microphone for Brodin Kuhl, 3, who addresses the crowd before the March for Babies event at Hopkins Park in DeKalb Saturday morning. Kuhl's family, including brothers Trevin (left) and Gavin (right) and their mother Kalie Kuhl, is the Ambassador Family for the DeKalb County 2012 March for Babies. The triplets were born 8 weeks early in May of 2008. 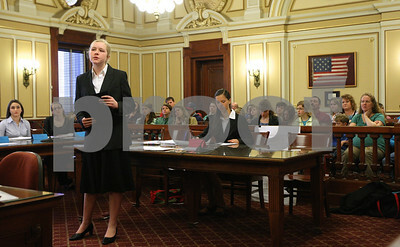 Kyle Bursaw – kbursaw@shawmedia.com Abbie Krug, an eighth grader at Freeport portraying defendant Barbara Allen Barrett on the witness stand, leans in to read a piece of evidence during a mock trial held at the DeKalb County Courthouse on Monday, April 30, 2012. 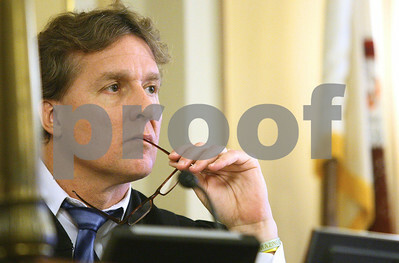 Kyle Bursaw – kbursaw@shawmedia.com Brad Waller, a Sycamore attorney, listens to opening statements from area eighth graders as the judge of a mock trial held in the DeKalb County Courthouse in Sycamore, Ill. on Monday, April 30, 2012. Kyle Bursaw – kbursaw@shawmedia.com Michaela McMahon, a home schooled eighth grader on the prosecution, gives a closing statement in a mock trial at the DeKalb County Courthouse on Monday, April 30, 2012. 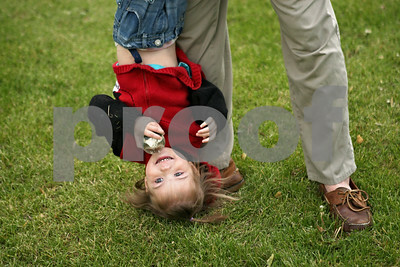 Kyle Bursaw – kbursaw@shawmedia.com Seven-year-old Mackenzie McConell lays flat, trying to coax Prim, a one-day-old goat, to climb on top of her behind the Genoa-Kingston softball team's dugout. 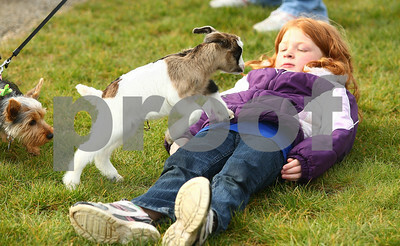 Mackenzie's sister is on the team and the family brought the goat so they could feed it at the game. 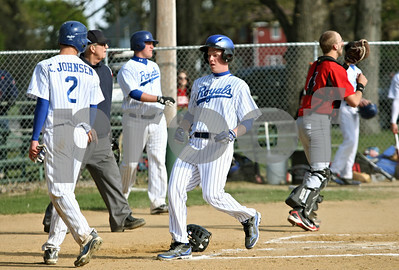 Genoa-Kingston lost 7-5 to Marengo in Genoa, Ill. on Tuesday, May 1, 2012. 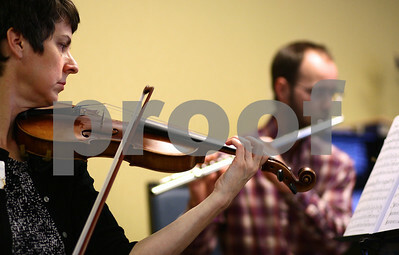 Kyle Bursaw – kbursaw@shawmedia.com Jen Conley, a music therapist with DeKalb County Hospice, plays Pine Acres resident Gloria Hasley's violin during a performance with Aaron Butler (background) and Lynn Slater (not pictured) for the residents of Pine Acres on Tuesday, May 1, 2012. Kyle Bursaw – kbursaw@shawmedia.com Brett Koenig calls a potential donor during the Ben Gordon Center's annual Call for Help pledge drive on Wednesday, May 2, 2012. Koenig is an intern at the Center. Kyle Bursaw – kbursaw@shawmedia.com Dr. Jeff Frank hangs up after finishing a call during the Ben Gordon Center's annual Call for Help pledge drive on Wednesday, May 2, 2012. Frank is a member of the Center's Foundation Board. 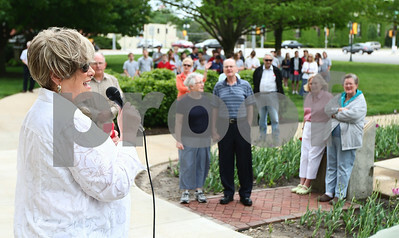 Kyle Bursaw – kbursaw@shawmedia.com Ruth Freund, a member of CrossWind Community Church in Genoa, leads the crowd in singing "God Bless America" at the National Day of Prayer ceremony on the DeKalb County Courthouse lawn in Sycamore, Ill. on Thursday, May 3, 2012. 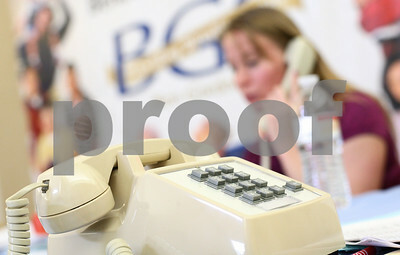 Kyle Bursaw – kbursaw@shawmedia.com A telephone waits at the ready as Dana Baars, chair of the Ben Gordon Center's Foundation Board, calls a potential donor during the Center's annual Call for Help pledge drive on Wednesday, May 2, 2012. 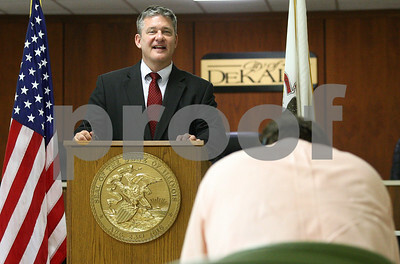 Kyle Bursaw – kbursaw@shawmedia.com Illinois State Treasurer Dan Rutherford talks to media and some DeKalb County residents in DeKalb's city council chambers on Thursday, May 3, 2012. 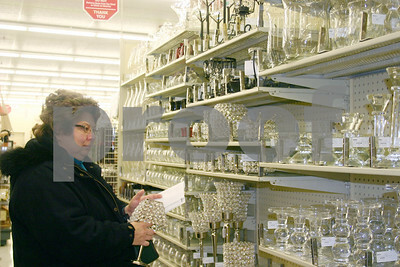 Rutherford was there promoting the Cash Dash program, which tries to return unclaimed properties to people. 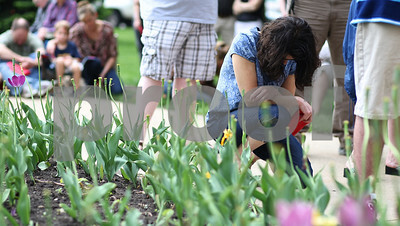 Kyle Bursaw – kbursaw@shawmedia.com Genoa resident Pam Piazza kneels in prayer during the National Day of Prayer ceremony held on the lawn of the DeKalb County Courthouse in Sycamore, Ill. on Thursday, May 3, 2012. Rob Winner – rwinner@shawmedia.com Sharon Ashley and her son Chase, 2, dig into a frozen treat together at Aspen Leaf Yogurt in DeKalb Friday afternoon. The self-serve frozen yogurt shop opened in February. 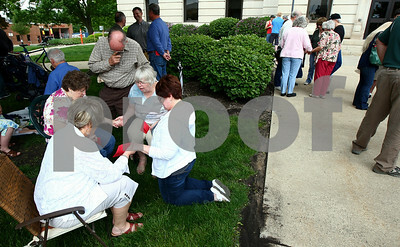 Friday, May 4, 2012 DeKalb, Ill.
Kyle Bursaw – kbursaw@shawmedia.com The crowd at the National Day of Prayer ceremony held on the lawn of the DeKalb County Courthouse divides into smaller groups to pray on Thursday, May 3, 2012. 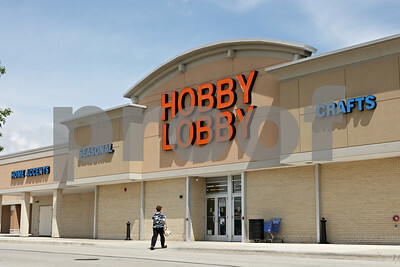 Rob Winner – rwinner@shawmedia.com Hobby Lobby located on Sycamore Road in DeKalb officially opened in January 2011. 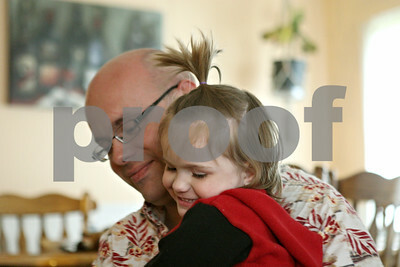 Friday, May 4, 2012 DeKalb, Ill. 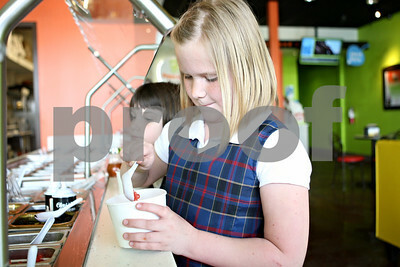 Rob Winner – rwinner@shawmedia.com Jillian Keck (front), 9, and sister Kaitlynn Keck, 7, choose toppings for their frozen yogurt during a visit to Aspen Leaf Yogurt in DeKalb Friday afternoon.The self-serve frozen yogurt shop opened in February. 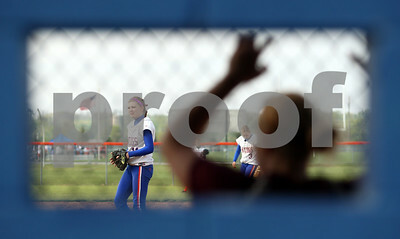 Friday, May 4, 2012 DeKalb, Ill.
Kyle Bursaw – kbursaw@shawmedia.com A Marengo player watches the game from the dugout as Genoa-Kingston pitcher Danielle Engle waits to get the ball back on the mound during the Cogs 7-5 loss to Marengo in Genoa, Ill. on Tuesday, May 1, 2012. Kyle Bursaw – kbursaw@shawmedia.com DeKalb skateboarder Addison Millhorn, 16, set the Guinness World Record for the most ollies in one minute at 50. Millhorn also rides for Smalltown Skate Shop, where he is pictured on Wednesday, May 2, 2012. Millhorn set the record on his first attempt and said he'll to push the record higher in the future. 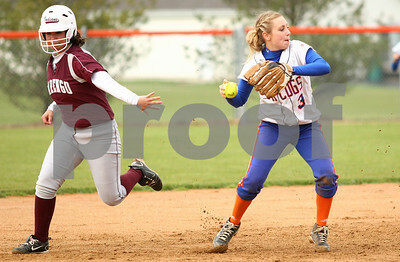 Kyle Bursaw – kbursaw@shawmedia.com Genoa-Kingston's Emily Wakely slides in safely between the legs of a Marengo player who did not make the catch at third in the second inning of the Cogs 7-5 loss to Marengo in Genoa, Ill. on Tuesday, May 1, 2012. Kyle Bursaw – kbursaw@shawmedia.com Genoa-Kingston's Baylie Ullmark grabs the ball off of a bounce in the first inning of the Cogs 7-5 loss to Marengo in Genoa, Ill. on Tuesday, May 1, 2012. 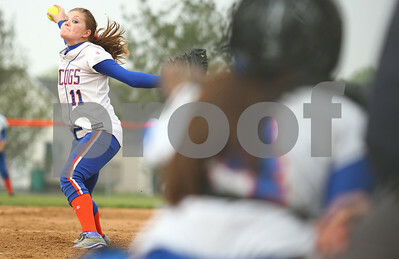 Kyle Bursaw – kbursaw@shawmedia.com Genoa-Kingston pitcher Danielle Engle delivers in the second inning of the Cogs 7-5 loss to Marengo in Genoa, Ill. on Tuesday, May 1, 2012. 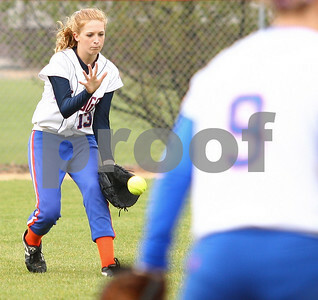 Kyle Bursaw – kbursaw@shawmedia.com Genoa-Kingston's Natalie Klein throws to first base during the first inning of the Cogs 7-5 loss to Marengo in Genoa, Ill. on Tuesday, May 1, 2012. 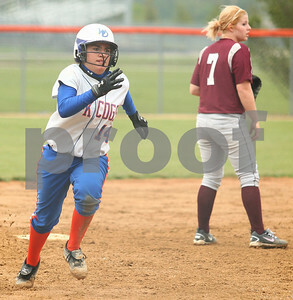 Kyle Bursaw – kbursaw@shawmedia.com Genoa-Kingston's Paige Keegan makes her way to home plate in the fifth inning of the Cogs 7-5 loss to Marengo in Genoa, Ill. on Tuesday, May 1, 2012. 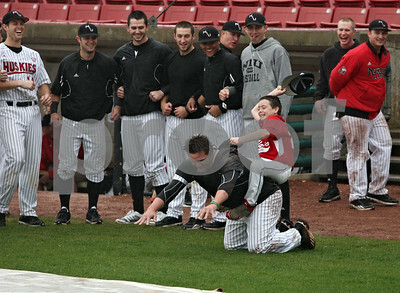 Rob Winner – rwinner@shawmedia.com Members of the Northern Illinois baseball team keep busy during Tuesday night's rain delay in Geneva before their game against Northwestern. 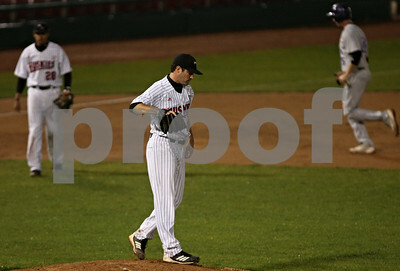 Rob Winner – rwinner@shawmedia.com Northern Illinois pitcher Tom Barry walks behind the mound after walking in a run during the top of the first inning in Geneva Tuesday night. 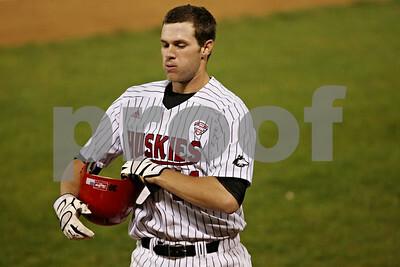 Rob Winner – rwinner@shawmedia.com Northern Illinois' Jeff Zimmerman heads back to the dugout after grounding out in the bottom of the second inning in Geneva Tuesday night. 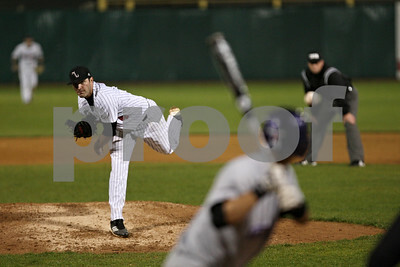 Rob Winner – rwinner@shawmedia.com Northern Illinois pitcher Tom Barry delivers a pitch to Northwestern batter Zach Morton during the second inning in Geneva Tuesday night. 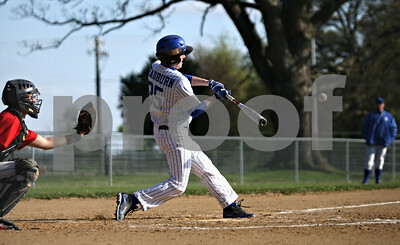 Rob Winner – rwinner@shawmedia.com Cory Bradburn connects with a ball during his plate appearance in the bottom of the second inning Tuesday, April 10, while facing Indian Creek in Big Rock. Rob Winner – rwinner@shawmedia.com Hinckley-Big Rock's Christian Johnsen (2) and Cory Bradburn (right) score on a double by Mitch Ruh (not pictured) during the bottom of the first inning Tuesday in Big Rock. 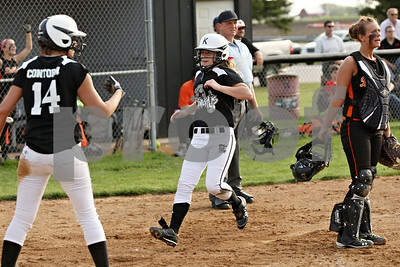 Rob Winner – rwinner@shawmedia.com After scoring the tying run, Kaneland's Haley Contorno (14) cheers as teammate Sarah Grams scores the winning run during bottom of sixth inning in Maple Park, Ill., Wednesday, May 2, 2012. Kaneland defeated DeKalb, 7-4. 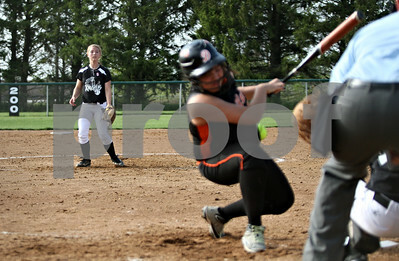 Rob Winner – rwinner@shawmedia.com Kaneland baserunner Paige Kuefler (left) is caught in a run down as DeKalb catcher Alysha Guy throws to second base during the bottom of the first inning in Maple Park, Ill., Wednesday, May 2, 2012. 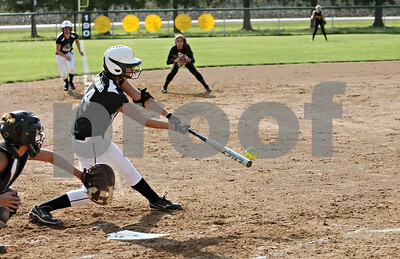 Kaneland defeated DeKalb, 7-4. 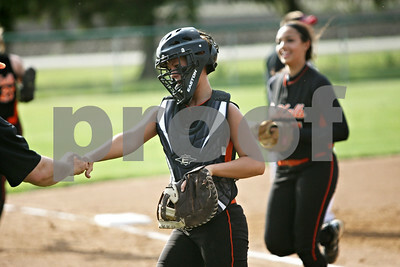 Rob Winner – rwinner@shawmedia.com DeKalb catcher Alysha Guy is greeted by her coach Jeff Davis (left) after throwing out Kaneland baserunner Paige Kuefler (not pictured) to end the first inning in Maple Park, Ill., Wednesday, May 2, 2012. Kaneland defeated DeKalb, 7-4. 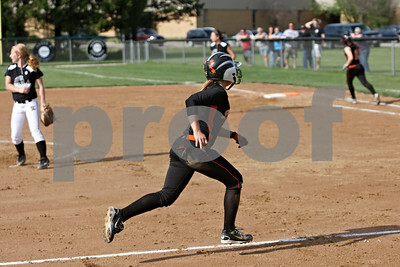 Rob Winner – rwinner@shawmedia.com DeKalb courtesy runner Samantha Volk heads home for a run after a hit by Rachel Johnson (right) during the top of the second inning in Maple Park, Ill., Wednesday, May 2, 2012. Kaneland defeated DeKalb, 7-4. 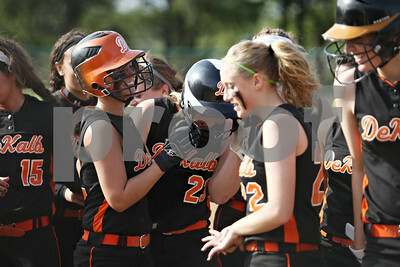 Rob Winner – rwinner@shawmedia.com DeKalb batter Sarah Friedlund (23) is mobbed at home plate after hitting a two-run home run during the top of the third inning in Maple Park, Ill., Wednesday, May 2, 2012. Kaneland defeated DeKalb, 7-4. Rob Winner – rwinner@shawmedia.com Kaneland hitter Haley Contorno drives in a run during the bottom of the second inning in Maple Park, Ill., Wednesday, May 2, 2012. Kaneland defeated DeKalb, 7-4. Rob Winner – rwinner@shawmedia.com Kaneland pitcher Delani Vest (left) hits DeKalb batter Payton Marten during the top of the third inning in Maple Park, Ill., Wednesday, May 2, 2012. Kaneland defeated DeKalb, 7-4. 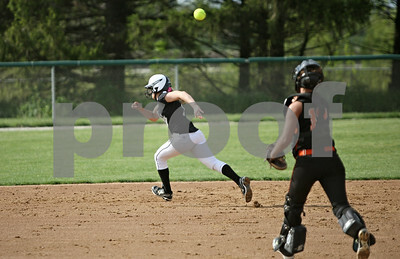 Rob Winner – rwinner@shawmedia.com Kaneland shortstop Allyson O'Herron (center) is unable to get to a grounder on the left side as DeKalb courtesy runner Samantha Volk advances to third base during the top of the third inning in Maple Park, Ill., Wednesday, May 2, 2012. Kaneland defeated DeKalb, 7-4. 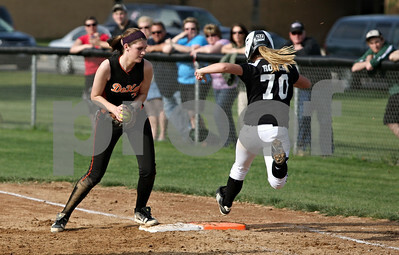 Rob Winner – rwinner@shawmedia.com DeKalb second baseman Haley Tadd (left) steps on first base ahead of Kaneland baserunner Lexi Roach (70) to end the third inning in Maple Park, Ill., Wednesday, May 2, 2012. Kaneland defeated DeKalb, 7-4. 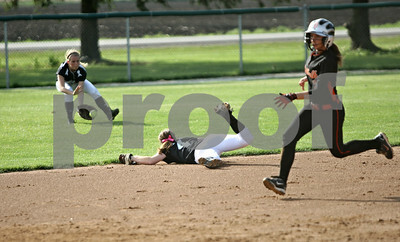 Rob Winner – rwinner@shawmedia.com DeKalb baserunner Lindsey Costliow (left) slides safely into third base ahead of the tag of Kaneland third baseman Paige Kuefler during the top of the fourth inning in Maple Park, Ill., Wednesday, May 2, 2012. Kaneland defeated DeKalb, 7-4. 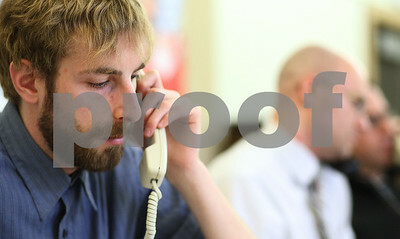 Brett Koenig calls a potential donor during the Ben Gordon Center's annual Call for Help pledge drive on Wednesday, May 2, 2012. Koenig is an intern at the Center.